Laila Ghannam's "actions for her nation" include ongoing promotion of terror by glorifying some of the most horrific Palestinian terrorist murderers, presenting them as heroes and role models, and promising to follow in their path, as documented by Palestinian Media Watch. 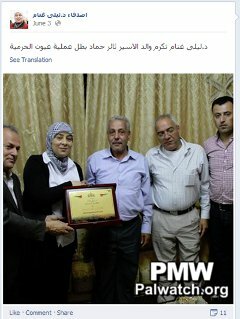 Ghannam categorizes murderers of civilians, among others, as Shahids (Martyrs), the highest status in Islam, indicating she believes murder of Israeli civilians is an act sanctioned by Islam, promoted by Allah, and an act to be admired by Palestinians. 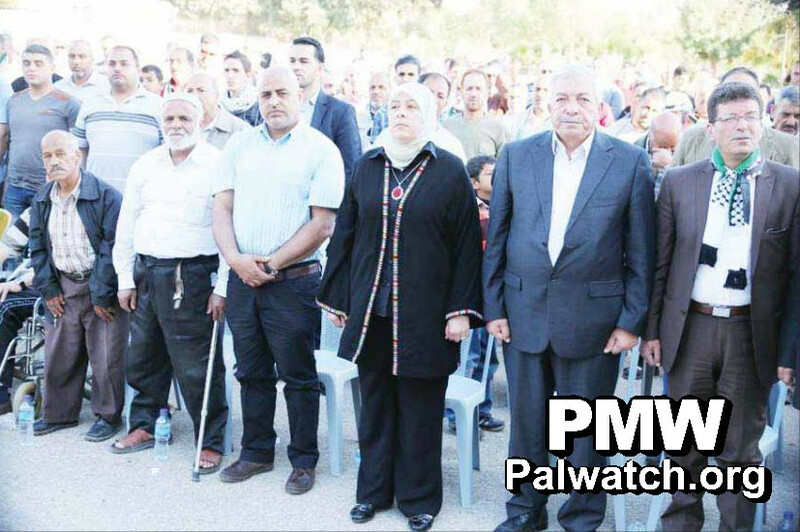 Ghannam honored Hamas bomb-builder for suicide terrorists Abdallah Barghouti, who is serving 67 life sentences for complicity in the murder of 67 civilians, by visiting his home and family. Laila Ghannam: "We promise and swear to these mighty ones: We are still [following] your path... The President and icon, Martyr Yasser Arafat, Dr. George Habash (founder PFLP), comrade Abu Ali Mustafa (head of PFLP), Sheikh Ahmed Yassin (Hamas founder), Fathi Shaqaqi (Islamic Jihad founder), Samir Ghosheh (Sec.-Gen. of PSF), Abu Jihad (a founder of Fatah) and all the great leaders." Sbarro restaurant (15 killed, 2001), Sheffield Club (15 killed, 2002), Ben Yehuda pedestrian mall (11 killed, 2001), Moment Caf? (11 killed, 2002), Hebrew University (9 killed, 2002), bus bombing (6 killed, 2002). "Laila Ghannam paid a solidarity visit to the family [of Barghouti]... Ghannam saluted all the prisoners in the prisons and prisoner Abdallah Barghouti's family and children." Ayyat Al-Akhras, killed 2 Israelis in a suicide bombing near a Jerusalem supermarket in 2002. Issa Abd Rabbo, murdered 2 Israeli university students who were hiking south of Jerusalem in 1984. He tied them up at gunpoint, put bags over their heads, and then shot and murdered both. Ghannam also visited the terrorist's family in April 2013. Savoy Hotel terrorists, 8 Palestinian terrorists took civilians hostage in the Savoy Hotel in Tel Aviv in 1975, eventually murdering 8 civilians and 3 soldiers. Ghannam honors the Savoy Hotel terrorists regularly by laying wreaths on their graves. She refers to them as "the Martyrs of the Savoy operation." 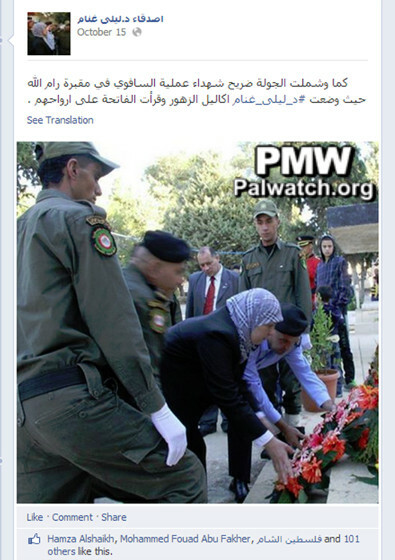 Ghannam places a wreath on the graves of the Savoy Hotel terrorists. Abu Ali Mustafa, responsible for killing dozens of people in his capacity as Secretary-General for the terror organization Popular Front for the Liberation of Palestine (PFLP). "Dr. Laila Ghannam honors prisoner Thaer Hammad, hero of the Oyoun Al-Haramiya operation." Thaer Hammad, shot and killed 3 civilians and 7 soldiers, in 2002. Abu Jihad (Khalil Al-Wazir), responsible for the murders of 125 people in his capacity as head of the PLO terror organization's military wing. In one attack he planned, 37 civilians, 12 of them children, were killed in a bus hijacking in 1978. Laila Ghannam at a rally marking the death of arch-terrorist Abu Jihad. Abu Iyad (Salah Khalaf), one of the planners of the attack in which 11 Israeli athletes were murdered at the 1972 Munich Olympics and the murder of two American diplomats in Sudan (1973). Ramadan Yaqub, killed one person in a stabbing attack in 1993. Jamal Abu Muhsin, killed one person in a stabbing attack in 1991. Mukhlis Sawafta, killed one person in a stabbing attack in 1990. Sa'id Tamimi, kidnapped and murdered one person in 1993. Abd Al-Rahman Yusuf Mahmoud Al-Haj, killed one person in a stabbing attack in 1992. Asrar Samrin, killed one person in 1991. Ziyad Mahmoud Ghneimat and Mustafa Ghneimat, killed one in a stabbing attack in 1985. Muhammad Al-Tous, gave the orders to murder 3 people and was involved in the murders of an additional 2 people. Ramzi Khamis Barrash, killed one person in a stabbing attack in 2002. Headline: "Ghannam: We will ring the bells of our nation's liberty from the heart of Jerusalem, and will not despair." [Ghannam] made these statements while receiving the Liberty Bell from [Philadelphia] City Council member Maria Sanchez in Philadelphia, Pennsylvania, [USA] yesterday [Jan. 30, 2015]. This bell, which symbolizes Philadelphia's independence day, means a lot to its citizens. In addition, Ghannam received a Citation of Honor, which has never been awarded to any Arab leader or citizen before, in recognition of her impact and her extraordinary actions for her nation and her cause, and her influence within her society and in the world... [Ghannam] made it clear that the land of Palestine was the cradle of love and peace, noting that Jesus was Palestinian, and that tolerance is one of the Palestinians' most prominent principles." Ghannam gave the parliamentary representative [City Councilwoman Maria Sanchez] a memento from the Palestinian heritage, and noted that this is our heritage, identity and the legacy of our ancestors. She also noted that the occupation (i.e., PA euphemism for Israel) was trying to steal it by using it in Israeli fashion shows and for the uniforms of the Israeli airline attendants. Ghannam clarified that stealing is their [the Israelis'] conduct, as they have stolen the land, and are now trying to rob all that is Palestinian, without anything to stop their savagery, criminality and unrestrained terrorism." 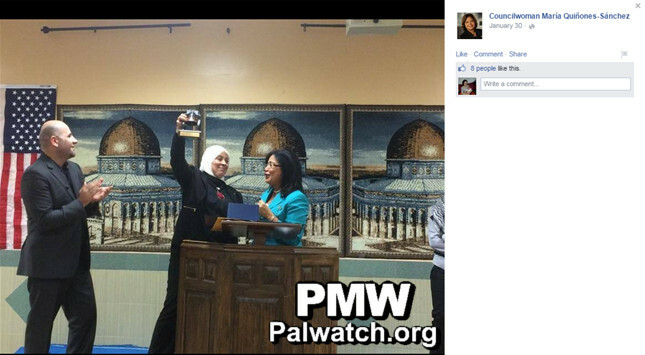 with the Liberty Bell and "Citation of Honor"
Yesterday, Palestinian Media Watch exposed that PA Governor Laila Ghannam, who was honored by Philadelphia Councilwoman Maria Sánchez, actively supports PA terror by glorifying terrorists and promising to continue their "path." Councilwoman Sánchez awarded Ghannam the Liberty Bell and "Citation of Honor" last month. "I fully and unequivocally denounce the sentiments attributed to Governor Ghannam in this video..."
"The use of the word ‘attributed' was simply because the Councilwoman can only read these statements in PalWatch's (PMW's) translation, as she doesn't speak Arabic. Her condemnation of the content, as translated, is unequivocal." Also in response to PMW's query, Sánchez's office added: "We will look into whether it is possible to withdraw a citation." Councilwoman Maria Sánchez has been serving the 7th District on the City Council of Philadelphia since 2008. I was invited to attend this event to meet the first woman elected governor in the Palestinian Authority, and whose work was described to me as humanitarian in nature and centered on furthering the rights of women and girls. My office honored her for these reasons. I fully and unequivocally denounce the sentiments attributed to Governor Ghannam in this video, and have consistently condemned terrorist violence. As an elected official who represents a significant Muslim-American population, including many Palestinian refugee families, I know my Muslim constituents to be good citizens and contributors to their communities. I strongly support interfaith efforts to build understanding across cultural and ethnic barriers, and I am committed to open, honest and productive dialogue with all who share the goal of peace." MIM: Update about the withdrawal of the award and Ghannams subsequent reiteration of report for terrorism. Philadelphia Councilwoman Maria Sánchez has withdrawn the Citation of Honor that she awarded to Palestinian Governor of Ramallah Laila Ghannam last month. Sánchez's action came after Palestinian Media Watch informed her and released a report documenting that Ghannam has a long record of glorifying Palestinian terrorists, including terrorists responsible for the deaths of hundreds of Israelis. Sánchez had been unaware of Ghannam's terror glorification at the time of the award, but immediately denounced Ghannam's statements praising terrorists. "We are not interested in citations of honor that require us to slander our fighters and our supporting pillars as terrorists." Ghannam also stated that the withdrawal of the award "emphasizes the US administration's alienation from the Palestinian struggle," and that Councilwoman Sánchez had "yielded to the terror of the occupier and the Zionist lobby." View more examples of Ghannam's support for terror here. Headline: "Ghannam: The citations of honor we value most are those we see in the eyes of the mothers of the Martyrs and the prisoners"
"District Governor of Ramallah and El-Bireh Dr. Laila Ghannam stressed that the citations of honor which are dearest and most significant are those we see in the eyes of the mothers of the Martyrs and the prisoners, in particular because they express our nation's heartbeat and uncompromising will. She clarified that the fact that Councilwoman Maria Sánchez, the representative of the city of Philadelphia, Pennsylvania, had apologized for awarding her a Citation of Honor - which was being awarded for the first time to an Arab leader - emphasizes the US administration's alienation from the Palestinian struggle. [Ghannam] noted that, according to Sánchez's statements, the citation had been withdrawn from her because of her 'support of terror.' The American Councilwoman wrote in a letter that the Palestinian and Arab community had deceived her when it claimed that Ghannam supported human rights and women's rights, whereas she was revealed to support terror with her actions and statements. She [Sánchez] also apologized to the occupation for having honored her and met with her. Ghannam described to the Councilwoman the attacks the occupation carries out against our defenseless people, the Judaization of Jerusalem and the attack on all that is Palestinian through killing, oppression and imprisonment. She also mentioned our male and female prisoners, stating that the harassment they are subjected to is the result of the world's silence in face of the occupation's arrogance and tyranny. In addition, the District Governor told the Councilwoman about the suffering of our people caused by the racist separation fence, which is consuming Palestinian land, and by the settler herds, and demanded immediate intervention to put an end to the tragedy the occupation has brought upon our people. Ghannam noted that these declarations did not motivate the Councilwoman to support human rights; on the contrary, she yielded to the terror of the occupier and the Zionist lobby. She [Ghannam] also emphasized that she would not apologize for having given the Councilwoman a memento representing the Palestinian heritage, which would continue to remind her of the injustice done to the Palestinians' rights and the fact that she had yielded to the occupier's terror, racism, tyranny and its persecution of all Palestinians, wherever they are. Ghannam said: 'We are not interested in citations of honor that require us to slander our fighters and the supporting pillars of our struggle as terrorists,' emphasizing that it is the occupation's actions against our defenseless people, and not [our people's] defense of its dignity and land, that is terror."